Today’s word-of-the-week names something that will be familiar to anyone living in Southern California. But don’t be turned off, people who demand reasonable commutes; it may be interesting to you as well. dingbat (DING-bat) — noun: 1. a typographical symbol or ornament. 2. a nitwit or kook. 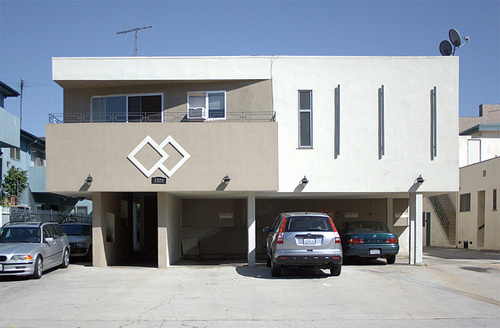 3. a type of apartment building typically consisting of two or three stories of residential space situation in a rectangular structure, often with parking on the bottom floor. It’s that third definition — the one that doesn’t appear in the Webster’s entry and which I therefore had to write myself — is the one that I’m focusing on today, though dingbat is clearly an awesome word that improves any sentence it appears in, regardless of it meaning. 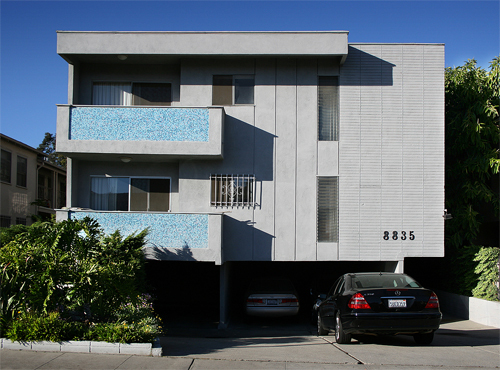 Since I moved to Los Angeles, I’ve repeatedly seen this style of apartment building in just about every neighborhood I’ve been to. (Not so much Beverly Hills.) Shaped more or less like a boxcar, these stuccoed-over structures seem to be designed to fit the most possible units into the allotted space. Often, they have names, and often these names evoke some dated sense of the exotic or the luxurious — the Chalet, the Continental, the Yucatecan, the Kon-Tiki, the Fair Winds, the Bahamian, etc. Even if you have no awareness of the time period they come from, looking at them instantly take you back to a vague late 60s-early 70s era in which everything is slightly yellow in color and the theme to “Three’s Company” is playing in the background. These, my friends, are the dingbats. 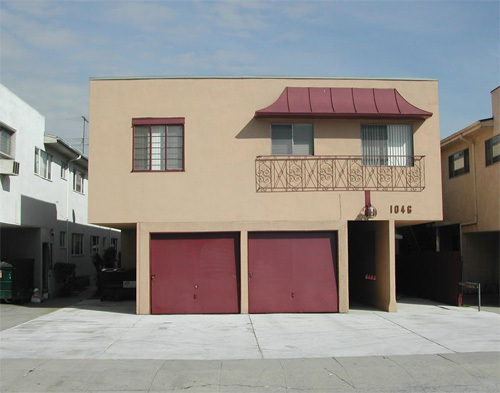 [Dingbats] are normally a two-story walk-up apartment-block developed back over the full depth of the site, built of wood and stuccoed over. 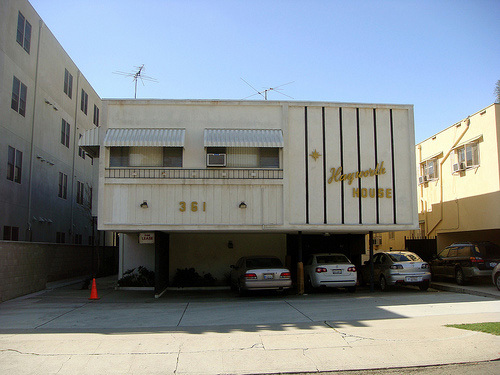 These are the materials that Rudolf Schindler and others used to build the first modern architecture in Los Angeles, and the dingbat, left to its own devices, often exhibits the basic characteristics of a primitive modern architecture. 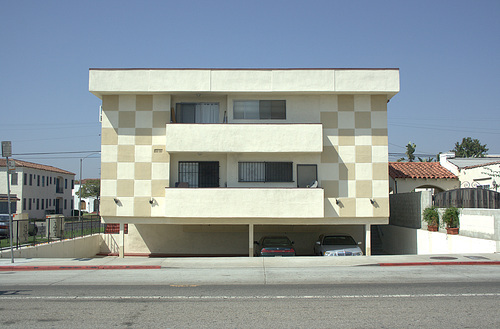 Round the back, away from the public gaze, they display simple rectangular forms and flush smooth surfaces, skinny steel columns and simple boxed balconies, and extensive overhangs to shelter four or five cars. And the next obvious question: So why call these little nothings dingbats? According to Etymonline, the term is a uniquely American one that arose back in the day when a lot of other fun-to-say words for unimportant things slid into general use: dingus, doohickey, gadget, gizmo and thingamabob among them. Etymonline notes that dingbat has over time referred not just to apartment buildings and typographical flourishes but also has meant “money,” “a professional tramp,” “a muffin,” “male genitalia,” “a Chinese,” “an Italian,” “a woman who is neither your sister nor your mother” and “a foolish person in authority.” It does credit All in the Family as helping popularize the “foolish person” sense of the term, though it also notes that this usage goes back to the early twentieth century. So remember: The next time you see one of these apartment buildings, know that it’s not just some architectural relic rendered kitschy by the passage of time. It’s a dingbat. ??? Not sure I understand. kill the minimum parking requirements!!! Let the market decide! I mean, if that's what you're into. Those buildings are from the 50's and 60's not 60's and 70's. Three's Company came 15 years later..